Edvin Cazun, of Guatemala, right, hugs his son Samuel at Cincinnati/Northern Kentucky International Airport as they reunite after being separated about a month ago at the southern border after they crossed the Rio Grande into the United States, Monday, July 23, 2018, in Hebron, Ky. Edvin said they were separated at the "detention" and he spent 15 days without knowing anything about his son. Before 14-year-old Guatemalan Samuel Cazun left a Kansas nonprofit to be reunited with his father, he gave staff members the sketches of their faces he had drawn to help them remember him. Of the dozens of migrant children housed at The Villages in Topeka under a contract with the federal government, Samuel was among as many as nine there who were separated from family members at the southern border under the Trump administration's "zero tolerance" policy on illegal immigration. 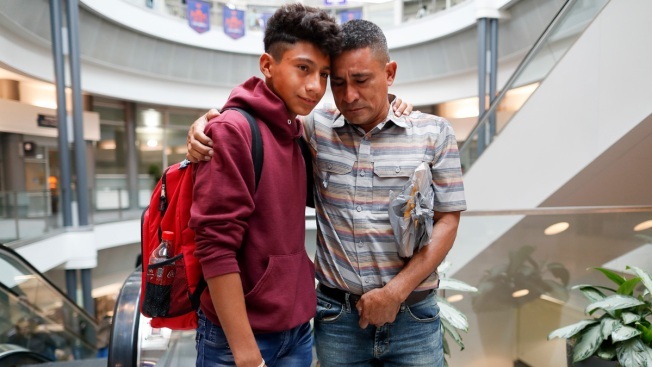 It has been more than a month since immigration agents took Samuel away from his father after the two waded across the Rio Grande into Texas following about 15 days traveling by bus from Guatemala. On Monday afternoon, Samuel and his father, Edvin Cazun, tearfully embraced at the Cincinnati airport, reunited once again. Samuel was all smiles when he caught sight of his father as he rode up on the elevator at the airport, waving to family members. A young cousin ran up to hug him. Edvin Cazun then briefly buried his head on his son's shoulders and embraced him before wiping away his own tears. While still at the airport, Samuel had a video chat with his mother in Guatemala on a relative's cellphone. Undocumented immigrants like Letty Stegall often were allowed to stay in the latter part of Obama's presidency if they had regular check-ins with ICE, paid processing fees, were fingerprinted and stayed out of trouble. An executive order issued by Trump changed that, effectively declaring any immigrant without legal status subject to arrest. Samuel told The Associated Press in Spanish that the separation was "very hard" and that it made him sad. He worried when he was in Kansas that his father would be deported and that he would never see him again. Edvin Cazun said he initially tried to come into this country legally by paying for a worker visa, but he was instead ripped off by the people selling them. When he tried to get his money back, they threatened to kill him. So he fled with Samuel to the United States, leaving behind his wife and his four other children, ages 9 to 18, and is now seeking asylum in the hopes of giving Samuel a chance at a better life. "What I want now that we are together is for him to get ahead in life. I want to be responsible for him. I want him to study in this country. That is the best future for him, no? That is my desire as his father," Edvin Cazun said in Spanish. Samuel said in a Tuesday phone interview that he wants to study in the United States and become a professional artist. 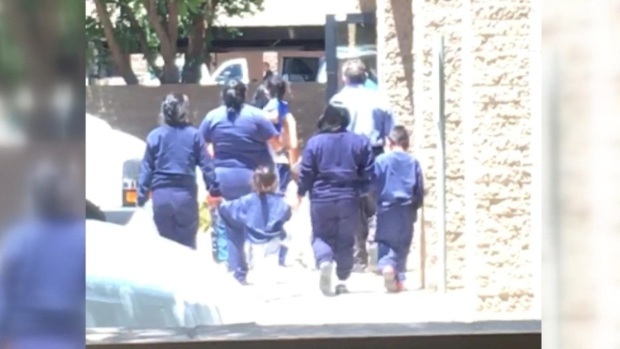 The Trump administration said in a court filing Monday that there have been 1,187 children reunified with their parents or "other appropriate discharges," which include guardians and sponsors. It added that some 463 parents may not be in the United States, saying those findings are based on case notes and are under review. Immigration attorney Clare Murphy Shaw is Samuel's attorney and said Tuesday that of the seven immigrant children in Kansas she represents in immigration court, five of them have already left The Villages. The two remaining separated children are scheduled to leave either Tuesday or Wednesday. Phoenix police officers were called twice over the past few months to an office building where migrant children have been detained and housed by a defense contractor. In what is the first public glimpse at life for migrant children at The Villages in Topeka, Samuel recounted how he was among 13 male teenagers housed in one of the group homes at the facility. He had his own bed and shared a room with another teenager. The food was good and the children could talk with their parents several times a week. They would also go to classes from 8:30 a.m. until 4 p.m. each day, studying English, mathematics, science, technology and other subjects. There were a lot of rules to follow, such as not hugging other children, although a handshake was ok. No opening the windows. Don't go into someone else's room. It was a lot nicer than facility the Samuel was kept in while in Texas. His first day he was kept in a cage that he compared to one used to contain animals. He slept on a mat on the floor. He thinks he probably spent five days at a second Texas facility but wasn't sure because there were no windows, the lights were on all the time and he couldn't tell whether it was even day or night. But the hardest part was being separated from his father. Samuel said he prayed to God while at the Kansas shelter that they would soon be together. "Now I am no longer sad," Samuel said.